Last night, I actually dreamt there was a washer/dryer that automatically folded the laundry. Some dreams may never come true. 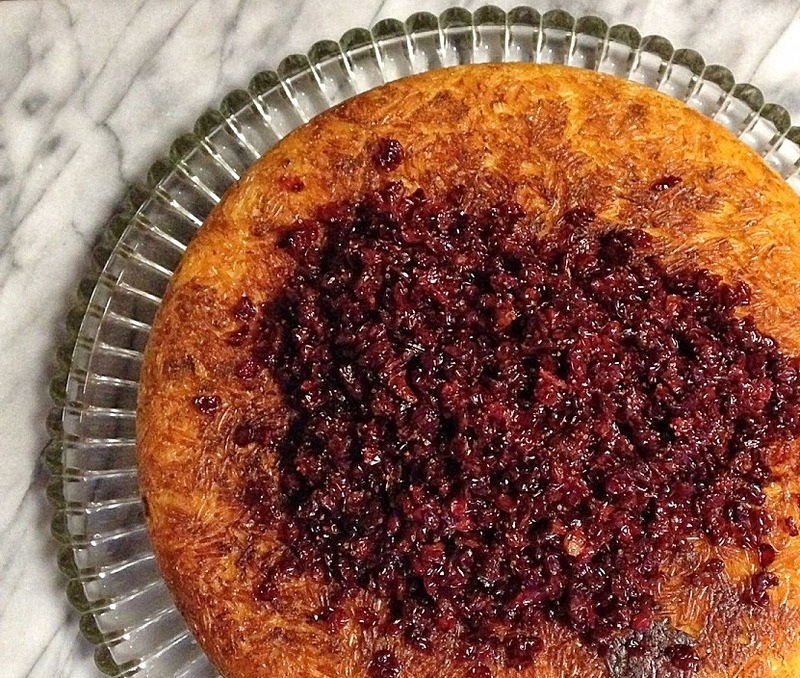 Thankfully, we can make some things happen without relying on luck, like Tahchin, a delightful saffron-scented rice cake crowned with little sweet-tart red barberries called zereshk in Farsi. Before serving, the rice is flipped onto a large platter, revealing the tahdig on top, covered in plump barberries for a stunning presentation. This is one of Mom’s favorites and the perfect dish to serve on her birthday. Everyone usually fights the tahdig which is the crispy rice that forms at the bottom of the pot. It might be best to make this in a large, shallow pan so there is more of that precious tahdig. Tahchin may seem complicated, but I have often whipped up a pot on a busy weeknight after work. For a Persian recipe, this one actually has very few parts. Chicken, rice, saffron, yogurt, eggs and barberries. Life should be this simple. Maybe we’d all be happier? Most of the work can be done ahead of time. The rice can be cooked early, as it must have time to cool. The yogurt-saffron custard can also be prepared early and stored in the fridge. Pick up a roasted chicken on your way home and you’ll have a showstopper on a weeknight, no less. Mom’s birthday was a success. My sister was in charge of the venue (i.e. big mess at her house), while I took on the menu. When Shawn brought the Tahchin to the table, Mom’s face lit up. It’s such a comforting dish. I wish you were here. Then you would know exactly what I mean. Remember those old cartoons when Tom & Jerry would float through the air, chasing the steam from the roast turkey on the table? That’s sort of what happens when you The fragrant steam rising off the rice spins around the sweet smell of the saffron, filling the air with this warmth that can only be Home. Cooked in a shallow non-stick pan guarantees there’s plenty of the treasured tahdig for everyone. I love making this every chance I get. It’s easy to make for a romantic dinner at home as well as to feed a crowd, even on a busy weeknight. Make it tonight and let me know how you like it. Your family will surely be impressed. Basmati rice is best for this sort of dish. The trick to make the rice fluffy is rinsing it until the water comes out clear. This process removes the excess starch coating the rice pebbles, allowing the rice to fluff up nicely during the steaming. ar-cooked until just fluffy, then divided into half. One half is enrobed in a luscious mixture of creamy yogurt, eggs, saffron and garlic, then returned to the pot. The remaining steamed rice goes on top with a generous addition of butter for the final steaming. Sounds involved, but it can be done even on a busy weeknight after work. The yogurt mixture can easily be made ahead of time. Traditionally, Tahchin is served with chicken. I like Mom’s simple recipe made with fresh lemon, but what you do with the chicken is your business. The chicken can also be cooked the night before or you can cheat by picking up a roast chicken from the market on your way home. Nestle the pieces of chicken between layers of rice or serve on the side in case you have a vegan/vegetarian guest. There are days when you want something, but you just can’t figure out what that something is. (I see you nodding.) Well, Tahchin won’t ever qualify, because after you taste it, you won’t have any trouble identifying a craving for it. Boring chicken and rice got a supermodel makeover enrobed in fragrant saffron. Make it tonight and let it wrap you in the warm goodness of Home. …and fresh Cottage Panzanella salad. Dear Colette, now I can see and read how this wonderful dish is done. I have heard a lot of stories about Tahchin but I have never attempted to make one let alone tasted one – so this is one wonderful way to get started. Your recipe looks amazing!!! I wish I could come by and have a plate of this wonderful treat, learn how to make it and then maybe enjoy it at home some day. What a wonderful recipe for a blog post! Wishing you and your very lovely family a fabulous weekend! Oh my goodness what a delicious looking dish that is rich with history! Thanks for this wonderful story and post!